Home Culture Why are they called Q-tips? Why are they called Q-tips? The “Q” in Q-tips stands for quality, and the “tips” describes the cotton swab at the end of the rod/stick. Q-tip is a product name for the worlds most popular cotton swab. Q-tips consist of one or two small piece(s) of cotton wrapped around one or both end(s) of a short wooden or plastic rod/stick. 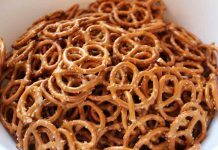 They are commonly used in cosmetics, first aid, cleaning, and arts and crafts. In 1923, Polish-born American, Leo Gerstenzang observed his wife, Ziuta, applying wads of cotton to the ends of toothpicks to clean their child’s ears. 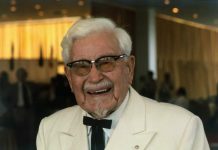 This observation led him to create the Leo Gerstenzang Infant Novelty Company to manufacture and sell his idea. In 1927, Gerstenzang applied for a patent for a “Process And Apparatus For Manufacturing Medical Swabs” to manufacture his invention. The final product was a double-swabbed boric acid-tipped cotton swab that was marketed to use on infants under the name Baby Gays. Apparently, Baby Gays made cranky babies happy. 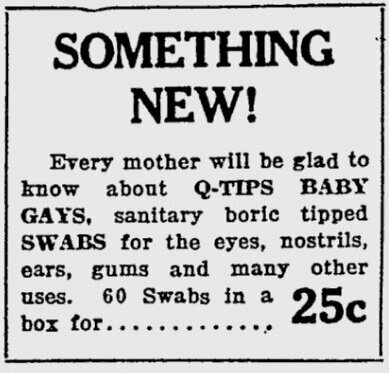 In 1926, he changed the name of Baby Gays to Q-Tips Baby Gays. Eventually, the Baby Gays part of the name was dropped, and the product was renamed to just Q-Tips, probably due to the multiple uses for the product. Over the years, Q-Tips recommended different uses for their product. The product box promoted Q-Tips for “adult ear care” until the majority of doctors agreed that using Q-Tips in the ears can do more harm than good. Today, each box has a warning against using Q-Tip in the ears. There used to be an entire line of “Q” products: Q-Talc, Q-Soaps, Q-Oil, and Q-Cream. All of these were sold together in a Q-Things kit. Q-Tips were made using wood until 1958 when the company bought Paper Sticks Limited of England, which made paper sticks for candy companies. Over 20 billion Q-tips are made every year. A Q-tip soaked in a soapy product like Windex can lubricate a stuck zipper enough to free it. Previous answerWhat does the convection button on my oven do? Next answerAre baked beans really baked?